In June, Mayor Bloomberg presented a 438-page proposal that laid out hundreds of ways in which New York needs to adapt to survive storms like Sandy, which hit the city almost a year ago. Some of his recommendations were sensible, others were intriguing. Most of them seeemed like long-term investments. But the city is actually already moving on several significant infrastructure upgrades—and they're poised to change the face of NYC forever. Seaport City was one of the plan’s most controversial points—and it seemed like a pipe dream until July 31, when the city put out an official request-for-proposals to study the feasibility of the project. 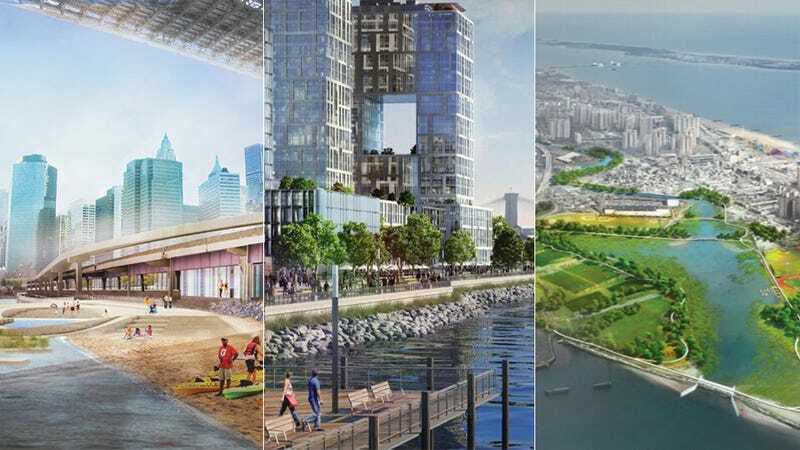 Here’s what it envisions: Infilling a 1.5-mile-long chunk of the East River at the tip of Lower Manhattan with dirt, a bit like Battery Park City, creating a giant levee that would protect the vulnerable towers behind it. And atop this giant levee? Plenty of sweet, sweet office and residential real estate. There are plenty of reasons why Seaport City has been criticized—beginning with the fact that it would cost the city $20 billion and completely change its geography. But the biggest warning many critics have given is that we don’t know enough about how the climate will change over the next fifty years to start building more structures near the water. In other words, it might protect Manhattan from the next few storms, but it could also endanger thousands of New Yorkers down the road. Nonetheless, the city is going to the trouble to study the concept further over the next year—so it’s not off the table yet. Not everyone thinks that putting new buildings on the river is the right approach. There are plenty of engineers and ecologists who argue for a strategy called "soft edges," or the creation of new marshes, sandbanks, and beaches around the city's borders, instead. The biggest, most realistic example of this strategy is the East River Blueway, a long stretch of salt-resistant marshes, sand beaches, and inlets that would slow the rise of flood waters around Manhattan. Designed by WXY Architecture + Urban Design, the project will create plenty of social infrastructure for tidal pool exploration and kayaking. But the underlying concept is actually something called "wave attenuation," or the creation of long, sandy banks that will absorb the energy from strong storm surges before they reach land. Another big question, of course, is what can be done to protect the buildings already standing (or the ones under construction). Back in April, buildings in Lower Manhattan were already retrofitting their basements with $250k metal gates that, in theory, would keep out storm surges. Bloomberg's report commended the practice, and recommended the city start installing 20-foot-high gates on vulnerable areas—especially around power plants. This week, as construction started on a gigantic, 800-unit apartment complex on the East River (above), the building's developers proudly reported that they'd be installing the latest in floodgate and backup generator technology, as per Bloomberg's recommendations. Some are thinking on a larger scale. Slate's Matthew Yglesias, for example, suggests borrowing an idea from the Dutch and damming the New York Harbor. "The best place to look for guidance is probably the city's former colonial overlords in the Netherlands," he argued. "The idea of essentially damming up New York Harbor sounds extreme, but that's equivalent to what the Dutch [have done]." Maeslant Storm Surge Barrier, the Netherlands via. It's a sensible plan, though you can't help but wonder if a gate or dam is like putting a band-aid on a much more serious injury. And if scientists and engineers,who argue that (dam or no dam) we shouldn't be building anything on the riverfront anymore, might be onto something. The one thing that's certain is that we have yet to feel what may be Sandy's biggest impact: Changing the face of the most recognizable city in the world, in ways we've only just begun to imagine. Mull over the huge Bloomberg report here—is there anything that jumps out at you that we missed?